One of the questions I often get about leading a group time, is how to manage behaviors of a group. I think group time feels out of our comfort zone because we’re so used to the small group experience. I honestly don’t know how teachers do it day in and day out! The more time you spend in front of a group the better you’ll feel about it. I remember the first time a new supervisor watched me lead a circle time during graduate school. The kids were two. It tanked. Instead of picking a song from the visual choices I gave, a preschooler demanded to hear a “cheeseburger song”. I didn’t know what to do, so I whipped up a made-up song called “I love cheeseburgers.” I don’t even remember what else I did during that circle. Maybe we read a book. The whole-time I could feel my cheeks getting hot. No one was answering questions or labeling the vocabulary. They were wiggling and all over the place! When it was over, I sheepishly apologized for what felt like a flop. They couldn’t pick a song, even when I gave visuals and we didn’t get to another activity. I made up a cheeseburger song. A cheeseburger song!? That didn’t match the curriculum. That great supervisor, she just smiled and declared it a success! She reminded me that these are little bodies and the goal for that student was communicating an idea – and he did it! He made a request and I honored that. The goal isn’t that you perfectly execute your lesson plan. The success is that you engage your students and help your students grow in their communication skills. Start by reviewing some expected behaviors. Our teachers use common language throughout the school for a good whole body listener. Many of them listen to this great Elmo song! I like to use it at the beginning of each circle. Using a “get ready to learn” song, chant, or introduction that the classroom teacher regularly uses will give you a great start to the group. It uses the predictability that kids thrive on to get them ready to learn. Plan for success! Use a variety of activities to keep your little learners engaged. Present your information in different ways! There is no way, a three year old can sit still on the carpet for 20 minutes. Use songs with movement and activities where the kids can get up and take a turn doing an activity. Set reasonable goals for each student. Hopefully you’ve created content that engages most students. 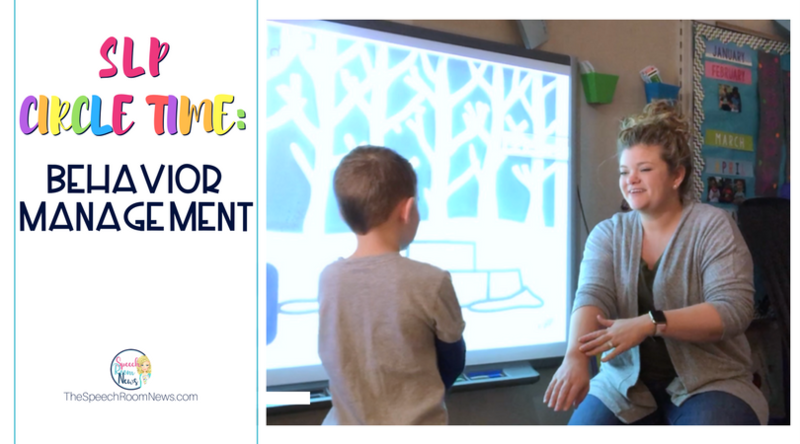 Even at your best try – every student isn’t going to be engaged and able to participate in an entire lesson every time. I try to pick an individual goal for students who are higher or lower than my content. Maybe my goal for one student is to be engaged 3 times in 15 minutes. Maybe another student’s goal is to answer more complex WH questions and give a story retell. You can target both of those in a group time. Be flexible. Some students can’t sit for 5 minutes let alone 15 minutes. If a kiddo wanders up to the front of the circle time, sit him on your lap or at your feet! Bring options for flexible seating including carpet squares, cube chairs, and fidgets for holding. Getting into a battle about a child sitting in a specific spot or a specific way will only distract the lesson. Try to keep going or have other staff in the room deal with it. Ignore the noise. One thing I help student teachers with, is to learn to ignore some noise while you’re working. When working with children with severe disabilities, you’re going to have to learn to not be distracted by squeals, stimming noises, or random AAC words coming out of a device! I once did a whole session while a child said “ketchup” on his device every 30 seconds or so. It happens! Keep going with your lesson as long as most of the group is engaged. Try to re-engage that student and then keep going. If you stopped to get it quite or make sure every single student was engaged you’d never get through it. You’ll also want to adjust your response to noises and interruptions based on the student and the function of the noises/behaviors. The better you know your students, the more you’ll know when to correct and when to ignore. Planned ignoring is maybe my favorite strategy ever. Just make sure you tell your team ahead of time that it’s your plan! Lastly, be prepared with behavior supports! I have so much to say about behavior supports, so check back for my next post all about my favorites visuals and aids! You can read my other circle time articles: 3 Types of Circle Times, Phono Circle Times; Targeting Multiple Goals during Circle Time.